While I have recently expressed concern to you and the wider industry about a number of challenges racing faces, it is important not to lose sight of the many great and positive things going on. This is particularly relevant at this early stage of the new racing season. The new season is somewhat of a fresh slate, full of promise and hope. Like spring, the new racing season is a chance for a fresh start, or a chance to build on the successes of previous years. At this stage of the year, final preparations are underway around the country for upcoming racing carnivals and events, such as the NZ Cup, which I will be attending in November. There is a sense of anticipation in the air, as the excitement and atmosphere of big racing events is unmatched. Great racing action and high-class entertainment create an environment where people want to be at the races, and is a highlight on the social scene for many throughout the country. These events also open racing up to a wider audience, and allow communities to join in the celebration of racing. For the most part, the industry has done a good job in enhancing this 'events management' side of racing. It is also heartening to see a wide range of new talent emerging across the industry. In particular, the Harness code has an exciting number of up and coming talent which has attracted much interest to the code. The recent successes of some younger drivers are a well-publicised example of this, but there is much less-public young talent around the country. This was made apparent during a recent visit to Cambridge, when I met a number of younger studmasters from the region at a lunch hosted by Sir Patrick Hogan at his Cambridge Stud. I was very impressed by the group, and it was a great opportunity to meet and have an informal discussion with those who are the future of the industry. If they are representative of those coming into the industry across the country, the industry's future will be bright. As an aside, I also had the pleasure of a visit to the Cambridge Raceway where I met with members of its board. My visit included a surprise offer of a few laps in a sulky (complete with a bright yellow 'Harness Jewels' jacket). It was a great experience, and I appreciated the opportunity to get out on the track. While the industry does face challenges both now and in the future, it is important to remember that racing already makes a substantial contribution to the economy. From creating tens of thousands of jobs to earning export dollars, the industry is worth around $1.5 billion dollars to the economy. This is worthy of celebration. New Zealand has very few industries making this level of contribution to the economy, and racing should be acknowledged for this. While facing challenges, there are many positive things happening in the industry. I congratulate you for making them happen. Last time I spoke to you, I told you what I had learned on taking up this challenging and exciting portfolio. Today, I'm going to tell you what I'm doing as Minister for Senior Citizens. Importantly, this Government supports the ten goals of the Positive Ageing Strategy. Based on these goals, I have chosen three priorities to champion over the next few years. These were the ones that I thought would have the most impact on older people in their day-to-day lives, and the ones that I thought we could get the most traction on at this time. The first is, promoting opportunities for older workers to remain in employment, if they choose to do so, by encouraging flexible work options and negotiated retirement plans. Today's older people are different from their grandparents, and even their parents. We're living longer, in better health, and doing more. It's a reality that already greater numbers of older people are opting to stay in the workforce longer, and the benefits are not just economic. Older people who keep working have more opportunities for social connectedness and often experience greater wellbeing. It is to New Zealand's detriment if we don't appreciate the wealth and depth of wisdom, experience and know-how that older workers bring to the workplace. The second priority I am championing is changing attitudes about ageing. Being involved, being seen, and having something to give helps change the younger generations attitude towards what it means to age. One excellent example of this is the Ministry of Social Development's SAGES programme, which connects older people with good practical talents to younger people who need help to develop practical skills. Older volunteers can be recruited and trained as mentors and then matched with families who need this support. Some of these families may have little or no contact with older people. When an older volunteer comes into their home and teaches them living skills, they are not just learning how to cook, or budget but they are getting to see the wisdom and experience of their elders in action. My third priority is raising awareness about elder abuse and neglect prevention. Elder abuse is not limited to any one gender, religion or ethnicity – in fact, estimates show that up to 50,000 older New Zealanders are likely to experience abuse. Even worse, they are likely to experience this at the hands of a family member. Age Concern, along with many others, are working extremely hard to clamp down on elder abuse and neglect, providing free, confidential advice and support to those facing this problem in their own lives. Sadly, too many are suffering in silence – and this has got to change. I hope you will support me in this. These three priorities, when actively promoted, addressed and championed, can have a very real affect on the day-to-day lives of older people, now and into the future. All of you will have heard stories about the dangerous and addictive drug P. Some of you will have family members or friends who have struggled, or who are still struggling with it.The drug is hugely damaging to those who take it and the people who share their lives. It comes hand in hand with violence. It allows gangs and organised crime to flourish. It entices young people into crime. The National-led Government is committed to using every tool we have to fight P use. Last week the Prime Minister announced our plan. Firstly, we're going to make it harder for people to manufacture P by controlling the availability of precursor chemicals. The main precursor – pseudoephedrine – can be bought over the pharmacy counter in a range of cold and flu medications. Up to a third of P labs busted by police each year have used cold and flu medication. There's a clinically safe alternative for cold and flu relief – phenylephrine. It's already used in up to three quarters of our cold and flu medications, and can be bought over the counter. That's why we're making pseudoephedrine prescription only. Secondly, we're coming down on gangs and organised crime syndicates who peddle P for a business. Customs is establishing dedicated anti-drug taskforces aimed at increasing seizures of P and its precursors at the border. Police will have more tools at their disposal than ever before, and they will take profits of these criminals and use them to fund anti-P initiatives. Thirdly, we're committed to reducing demand for P, helping addicts quit and deterring new users. We'll make treatment available for more than 3000 extra patients over the next three years. We're expanding specialist services where addicts can get the immediate support they need, and follow-up services to help them stay off the drug. Police and the Courts have the power to divert users into treatment. We're also making sure frontline staff in government agencies know how to provide P users with information and support. Most importantly, we'll help families and doctors get addicts into treatment. Fourthly, we'll help our schools, whanau, clubs and businesses to support addicts and deter new users. We'll work with voluntary organisations, promote new drug guidelines for schools and direct community programmes to focus on tackling P.
Finally, we'll make government chief executives accountable for getting results. National is tackling P from all directions. We're cracking down on precursors, breaking supply chains, providing better routes into treatment, supporting families and communities and strengthening leadership and accountability. This will make a difference for hundreds of families and make our community safer. Civil defence is an issue that most people only think about when a disaster happens. The recent tsunami threats and the current Disaster Awareness Week highlight the importance of being prepared for natural disasters, and also show the need for emergency services and Civil Defence to be ready to respond to such events. While the civil defence response to the recent tsunami went well overall, there are some issues that require attention. As Minister of Civil Defence, I have asked for a comprehensive review of the Ministry of Civil Defence's response as a first step towards resolving these problems. The Prime Minister has also announced that an independent review focussing on how public information was managed will be done. Despite these problems, I am happy that the regional response to the recent alerts went very well. The regional response is particularly important, as under our overall civil defence arrangements, civil defence on a local level is organised by local authorities, who must plan for and provide responses to emergencies within their districts. This regional organisation allows planning and responses to reflect the needs of local communities, as civil defence requirements here in Northland are different to those in somewhere like Otago. Here in Northland, both official and unofficial reports are that the overall response from local civil defence was very good. It was great to receive messages of praise from Northlanders, such as one email from a Taupo Bay resident passing on a 'well done' for the organised and professional way the residents of the Bay were evacuated by local civil defence. Another example is the region maintaining its warning status for some time after the Ministry of Civil Defence cancelling its warnings. That was because high tide was beginning at the time and local civil defence wanted to be sure that the on-going high sea levels combined with high tide did not present further issues. This is how the system should work - regions should take control of their own response, think on their feet and adapt responses to suit the local environment. It shows why Northlanders should have great confidence in their local civil defence organisation. No matter how good the local or national response is to a natural disaster, the best thing you can do is prepare yourself for an emergency. Being prepared is simple, and if you are prepared, you are more likely to be able to look after your family in the event of a disaster. The first step is to prepare a survival kit for your family, and make a plan for what you would do in an emergency. The Government is committed to making sure we have the best possible civil defence and emergency management systems and support in place throughout New Zealand. However, as the TV advertisement says, you should also "get ready" to "get thru". Civil defence is an issue that most people only think about when a disaster happens. The recent tsunami threat and the upcoming Disaster Awareness Week highlight the importance of being prepared for natural disasters, and also show the need for emergency services and Civil Defence to be ready to respond to such events. While the civil defence response to the recent tsunami went well overall, particularly on a regional level, there are some issues that require attention. As Minister of Civil Defence, I have asked for a comprehensive review of the Ministry of Civil Defence's response as a first step towards resolving these problems. In addition, the Prime Minister has announced that an independent review focussing on how public information was managed will be done. The details of this review will be made public shortly. Work is also underway on civil defence arrangements in the Auckland region. Under current arrangements, civil defence on a local level is organised by local authorities, who must plan for and provide responses to emergencies within their districts. This regional organisation allows planning and responses to reflect the needs of local communities, as civil defence requirements in Auckland will be different to those in somewhere like Otago. The Auckland local governance reforms provide an opportunity to organise the region's civil defence arrangements to take advantage of the benefits of the new unitary Council. It is also vitally important to ensure that civil defence arrangements are in place during the transition from the existing governance setup. A new structure will establish centralised control and coordination of civil defence services in the region, and will decentralise delivery of emergency responses to local civil defence teams in three geographical zones. Such a structure would ensure local civil defence staff have local knowledge, and will concentrate staff and assets more efficiently than the current arrangements. It will enhance co-ordination, and will promote increased sharing of skills and experience. It would also allow effective control to be maintained during emergency responses, and has the advantage of matching the sub-regional arrangements of the other emergency services in the region. In practice, this means that the new Auckland Council will take over the civil defence responsibilities currently carried out by the eight existing councils in the region, and will respond to events through an improved and more co-ordinated structure. The Auckland Transition Authority is working closely with the Ministry of Civil Defence to ensure the region is prepared for any emergency during the transition to the new Council, and that the region is best prepared for future civil defence emergencies. We are committed to making sure we have the best possible civil defence and emergency management systems and support in place in both Auckland and throughout New Zealand. However, as the ad says, you should also "get ready" to "get thru". Since the process to reform Auckland's local governance began, Aucklanders have made it clear that they wanted the 'local' put back in local government. The Government has listened and has made substantial improvements to the proposed structure of the region's local governance to reflect Aucklanders' wishes. To achieve this, we have empowered and enhanced the new local boards to allow them to better represent their communities and the boards will now be able to adequately represent, advocate for, and make decisions on behalf of their communities. The local boards will now be better able to promote the social, economic, environmental and cultural well-being of communities within the local board's area. The principle of the recent legislation passed by Parliament was that decisions about services and facilities will be made by local boards, unless there is a good reason for making them on an Auckland-wide basis. In general this will mean that the local boards will continue to manage the local services and facilities that the existing councils currently do, and will leave regional issues to the Auckland Council. Local boards are to engage with community organisations and groups within their area, and will develop and adopt a local board plan which reflects the priorities and preferences of their communities. They will also be able to develop bylaws specifically for their area and propose these laws to the Council. They will also be expected to develop an agreement with the Auckland Council for the delivery and funding of local services and facilities which suit the needs of their particular areas. This will allow communities to make choices about which local services they want their boards to provide, and how they will operate. Once these agreements and responsibilities are agreed to by the board and Council, they will not be able to be taken away without agreement. Where disagreements arise, a disputes resolution process will be put in place. As with the fine-tuning of Auckland's boundaries, the Local Government Commission will shortly be consulting with Aucklanders on the details of the new local boards. The Commission is required to have details such as the names, number, boundaries and number of elected members on each of the boards decided by 1 March 2010. The Government will also shortly introduce a third bill relating to Auckland regional governance that will have more details on the ongoing governance structure, functions, roles and the powers of the council and local boards. We will widely publicise this, and will listen to Aucklanders' views on the bill. The changes give Aucklanders a structure that allows local community management to be looked after on a local level, while allowing wider issues to be addressed on a regional basis. By enhancing the role and responsibilities of local boards, we have put the 'local' back into local government, just as you asked us to. Our young people are important. We want them to succeed. We want them to reach their full potential. National is concerned that for young people starting out in their working lives, a long period of unemployment could be very damaging. 18 to 24 year-olds make up a third of those on the Unemployment Benefit. The number of young people who want a job but can't get one has more than quadrupled in the past year from 4000 to 17,000. We can't afford to leave young people languishing on a benefit. This risks diminishing the potential of an entire generation of Kiwis. That's why the Government recently announced our Youth Opportunities Package. It invests $152 million and aims to create up to 16,900 new opportunities for under 24-year-olds over the next 18 months. The package includes nine initiatives designed to create opportunities for young people in work, education, and training. Job Ops backs businesses that create work opportunities for young people. We are asking firms to provide up to 4000 young people with an entry-level job for at least six months. We will pay a $5000 wage subsidy for each placement. Community Max invites local councils, mayors, community groups, and iwi to play a role creating up to 3000 work opportunities. We want community organisations to come to the Government with local projects that could employ young people and engage them in our communities. We will pay the minimum wage for 30 hours a week for up to six months, a training payment, and one supervisor for every four participants. We are also jump-starting our Youth Guarantee initiative. Some kids learn more from pulling an engine apart than studying Macbeth. Up to 2000 16- and 17-year-olds not engaged at school will get the opportunity to do fees-free training at polytechs, wänanga, and private training institutions. Here in Northland, 35 Job Ops positions across a wide range of industries have already been filled, and another 30 positions are available. As part of the Youth Guarantee, more than 80 places have been created here at local tertiary and training institutes. G & H Training and North Tec will provide young people with the opportunity to take part, free of charge, in courses like in tourism and travel, agriculture, building, plumbing, hospitality and catering next year. Other initiatives in the package include extra training places for careers in the Defence Force, 1600 summer scholarships for university students, and 2500 new places in military-style training programmes. The package also includes up to 500 jobs for young people on National Cycleway projects, 600 new Industry Partnership training opportunities, and a funding boost for polytechs and technology institutes. It's up to individual young people to make the most of these opportunities but we owe them a chance, and they owe us their best efforts in return. By working with businesses and communities National is determined to secure a brighter future for young New Zealanders and our economy. It's great to see consensus is building for a unified Auckland. The newspaper headlines in recent days are reflecting what I'm hearing in the many public meetings I've been holding throughout the city to discuss plans for a single region-wide council that has the ability to get things done. "If ever the case for a single city was clinched it was last week on Queens Wharf," said the Herald. "Such a fragmented approach to developing the waterfront is a strong argument for the Super City. At the very least, there would be fewer heads to bang together," wrote columnist Bernard Orsman. And their comments are now being echoed by most of the region's mayors. Waitakere's Bob Harvey said his vision was "to unify the interests of New Zealand with the interests of Auckland into a single commercial, environmental and political approach to face the world," while Manukau's Len Brown says he wants to see a city "where we work towards common goals that will ensure Auckland moves forward economically and socially". ARC chairman Mike Lee calls for "more democracy, less bureaucracy". And it's hard not to agree with them. Indeed, after initial political posturing, even the Labour opposition is swinging in behind the vision for a unified Auckland, which can capitalise on opportunities and act quickly on issues of regional import. It was also good to see a Greens spokesperson making the very strong point that conservation objectives are likely to be better achieved by a unitary authority. This is the sort of contribution that could be supported by a submission outlining how that can be the case. As chairman of the select committee considering the case for change in Auckland I certainly hope we see useful submissions from individuals and groups right across the community. The proposals that the Government has on the table are up for discussion. What has become clear, is that communities want their unique identities protected, they want local representation that reflects their diverse needs. That is precisely what the Government wants, and that is why we are listening to Auckland. It's why we welcome the efforts of groups helping people prepare submissions and get their voices heard by the special select committee considering local government reform in Auckland. I'm heartened by the thoughtful contributions I'm getting from communities and interested ratepayers, and delighted by the constructive approach that we're beginning to see. The Queens Wharf announcement is an example of what communities, local authorities, and central Government can do when they work together. Auckland is set for the change it desperately needs to compete as the world-class city. The Royal Commission called for a united Auckland with one council and there is now largely political consensus that this is the way forward for the region. And as recommended by the Royal Commission, the changes need to be made in time for the local Government elections late next year. So to realise the Commission's aim, the Government has passed technical legislation to create the Auckland Council as a legal entity and establish the Auckland Transitional Agency (ATA). But in a departure from the Royal Commission's proposals, the Government has set up a select committee so you can have your say on the structure of the Auckland Council and the boards which will be delegated with significant responsibilities to represent your community. The select committee will call for public submissions and hold two series of hearings: one on the make-up of the Council and boards, and the other on their powers. This will give you two opportunities to have your say on top of the ongoing programme of public meetings being held across the city. Your submissions will help fine-tune the sort of representation you want for your community, so it is worthwhile making submissions covering what you want your local council to do for you. The local, local authorities will have funding for grassroots activities, and, unlike the current community boards, aspects of their role will be supported by legislation rather than wholly delegated as they are at present. Meanwhile, the Auckland Transition Agency (ATA) will work closely with existing councils. That Agency will not affect the important daily work of your council, its job is to manage the change process, which will lead to better representation for local communities and more consistent planning across the region. As the Bills go through Select Committee the Agency will be listening closely to what Aucklanders want. The goal is to help ensure Auckland continues to grow and develop as smoothly and seamlessly as possible. Your local government services will roll out business as usual, and in October 2010 you will elect new councillors to the Auckland Council and to decide who you want representing you on your local authority. Your submissions, made now, will help decide what your local board looks like, what it can do, and how it operates. I am constantly being reminded of Aucklanders' enthusiasm for a united authority -one rates bill and clean clear lines of decision-making that will allow Auckland to grow as a world-class city. The National-led Government has taken action and set the scene for more cohesive and representative Auckland local government. We are talking with ratepayers, residents and community groups to ensure the best possible outcomes. I have been elected to chair the Auckland Governance Legislation Select Committee, with Tau Henare as deputy chair. The Committee will hold two sets of hearings. The first will consider the structure of the Auckland Council and the proposed 20 – 30 local boards. The second will consider the powers of the Council and boards. The Committee has now called for submissions on their structure. Submissions close on June 26. We can't accept any submissions after this date, so please make sure you get them in. We want to hear from you. We will pay close attention to your submissions. We will set the locations for hearings once we have your submissions. Submissions can be sent to us at ALG@parliament.govt.nz or by post to "Clerk of the Committee, Auckland Governance Legislation Select Committee, Select Committee Office, Freepost Parliament, Wellington". We have received a lot of interesting and informed emails from many of you. These emails cannot be treated as submissions. Therefore, if you want to be heard as part of the Select Committee process, make sure you send your submission to one of the addresses above. The Select Committee will also receive submissions on functions and powers of the Council and your local boards later in the year, or early next year. Join the process and help create a united Auckland that represents us as we grow as a world-class city. When the Government unveiled its preference to improve local government representation in Auckland the public could be forgiven for thinking that there was widespread opposition to all the proposals. The reality is quite different. There is a growing consensus around the need for a single council to represent the Auckland region - a council that can get things done, and plan strategically for the region's future. The main opposition party in Parliament supports a single council. They agree that Central government needs to take a leadership role in co-ordination of activity and strategy formulation to attempt to overcome insular thinking and the direct competition between local communities. Perhaps motivated by a looming by-election, politicians who appointed the Royal Commission are now trying hard to give the impression that they would abandon bringing better governance to Auckland – and they offer no alternative. Many of the Opposition politicians who support a council with a careful eye on the region as a whole are now searching for gaps in the process and shifting their views to wherever they feel advantage may be found. It seems to be opportunistic. The whole Royal Commission recommendation was held up as being essential, now, according to some, it isn't. I guess that's politics, but the Government believes the Auckland region deserves better than that. We are keeping our eye on the ball, and are encouraged by the growing consensus around a single council for the Auckland region, and the unanimous view that we need to improve representation at the grassroots. The strengths and priorities of local boards will be driven by the people they serve. They will have legislated functions based on the preferences that emerge for each community through the submissions process. The Government is listening and has established a special select committee to hear concerns and test ideas. We're encouraging you to contribute to the select committee as groups, communities and as individuals, with public submissions likely to be heard through into September. A third bill will go through the select committee process late this year or early next. However, what is clear at this point is that many of those who publicly oppose a single council for Auckland, privately agree with the concept. The by-election in one corner of Auckland will soon be over and the public will draw their own conclusions about what has motivated some of the opposition. Meanwhile, we are continuing to meet with you, to answer your questions and encourage you to put forward your views on how we can make Auckland even greater. 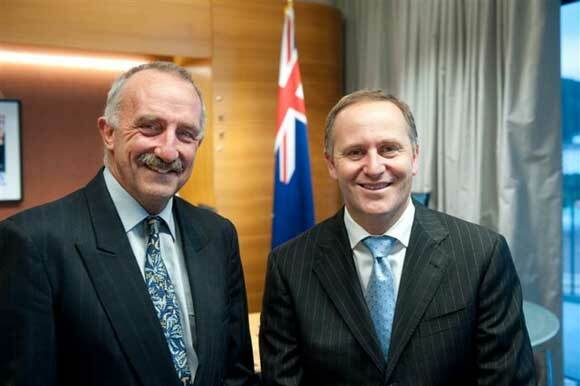 Prime Minister John Key and Associate Local Government Minister John Carter. The Government has kick-started the process to reform Auckland Local Government so that it can better deliver services to ratepayers, manage region-wide infrastructure and plan for the future. This week legislation allowing a transition authority to be put in place passed in Parliament under urgency. This bill was essential to get the process started, but it is just the first leg of a longer journey towards a single council for the Auckland region. Fragmented local government is holding the city and region back. As the Royal Commission on Auckland Governance concluded: "Failure to take action will result in citizens and businesses continuing to incur high transaction costs in dealing with councils; important decisions either not being made or made too late." So, the transition authority and its associated legislation is critical, as the Royal Commission explained; "existing council staff will be concerned about their future. The public will want to know that council services will continue to be provided at usual locations and that democratic processes are to be maintained. For these reasons, it is essential that the whole process is well managed and the transition work gets under way quickly." While it was important to get the work towards a smooth transition underway, we have also initiated a significant exercise in consultation around the shape of the greater 'Auckland Council' which we expect to continue for several months. A second bill to discuss the number of local boards and their functions with the community will be subject to a select committee process lasting more than three months. We will keep you informed on when and how to make submissions. Submissions on a third bill, which will determine the powers of local boards and the council, are expected to be called late this year, or early next. Aucklanders will have significant opportunities to give the Government your views. This Government will put the local back into local government in Auckland. That is why we are proposing a large number of local boards which will work at the grassroots and more accurately reflect the needs of the communities they serve. Right now though, communities need to tell us how local boards can work for them. We have deliberately designed our legislation timetable to allow for public input. Think about how you want your board to look in the years to come, and make submissions based on your vision for your new Auckland. The fourth annual Auckland Cup Week is with us, and this premier event continues to enhance an industry built by gifted amateurs and visionary professionals. This event sits at the apex of an exciting racing calendar that plays out across the country with 150 race days, the work of thousands of volunteers and the participation of 27,000 racing club members all helping make the industry what it is. It is inclusive of the industry, with thoroughbred, harness and greyhound racing finding favour and strong public support, and all showcased in an environment of gala dinners and other events. It is particularly gratifying to see the participation of so many young people keen to continue the strong racing heritage that links generations of New Zealanders. The people of Auckland and the racing fraternity generally are building Auckland Cup Week with their fabulous support for an event that underlines the solid reputation of New Zealand racing and enhances the nation's prestige. Racing contributes $1.48 billion dollars to the economy, and creates thousands of jobs. I look forward to working with the industry to see more growth and more jobs, and this hallmark event is a tribute to the people who comprise our excellent and diverse racing community. The Auckland Racing Club deserves the warmest congratulations for bringing this occasion and its supporting events onto the racing calendar. The recent events involving a pregnant 14-year-old girl being caught several times while driving drunk underlines a number of issues that we need to address. We all know teenagers can be a handful. We know that it is a hazardous time when experimentation and a natural inclination to rebellion make for a very heady cocktail. It can be a trying time for the best of parents, and an absolute liability for the community when parents fail to take their own responsibility for their family seriously. They may lack the parenting skills, or they may simply lack the inclination to guide their children. In many cases, the responsibility falls largely to the sole care of a single parent – and that can sometimes be too much for them especially when they also have other, younger children to care for. Keeping track of wayward and high-spirited teenagers can prove very difficult. Parents need to watch for the warning signs and get help early on. Relatives, friends and neighbours need to show concern and also take some interest in the young people around them. Quite often a teenager will listen to someone who is not a family member and take heed of the advice they are being given just because it is not coming from their mother or their father. Such is the fickle nature of the average teenager. The many people who give their time as sports coaches, youth leaders, St John, ATC Cadet trainers and other volunteers working with young people are to be commended – they are invariably a positive role model in the lives of the youngsters they help. But we have too many underage teenagers getting easy access to alcohol, and the public face of this is very unpleasant and upsetting. It may be time to consider what messages we are giving teenagers by allowing this easy access to alcohol. I voted against lowering the drinking age at the time, and I was in step with the message I was getting from my constituency. It is evident my constituency – and others around the country – still feel the same way after a raft of drink-fuelled incidents that have often resulted in absolute tragedy. There may well be a need to take another look at the drinking age – to recognise that 18-year-olds will buy alcohol for their younger siblings who will use it foolishly and excessively. It could be time to consider moving the access to alcohol away a bit further – perhaps back to 20-year-olds – and hope that helps reduce the incidents of excessive teen drinking. I also have some concern at the pre-mixed concoctions now freely available to young people. These branded mixes have high alcohol content and they are packaged and presented in exactly the same way as soft drinks. The connection and the easy movement from soft drinks to pre-mixed alcohol is being made seamless for teenagers by slick marketing and sugar-based mixes that the young palates readily accept. The implication, in the young mind, is that soft drinks and alcoholic drinks are almost identical. They are not. The difference can be measured in the level of wilful damage, street mayhem, road carnage and wrecked lives left in the wake of young people out of control on alcohol. Alcohol and teenagers is seldom a good idea. The damage left by excessive drinking would be at least as harmful as that left by the use of illegal drugs, and yet we almost condone and accept that people considered too young too vote are not to young to be exposed to the risks of excessive alcohol use. The fires that ravaged Dargaville early in the New Year did a lot of damage to several businesses and the township's historic skyline, but they also did something else. They underlined the depth and resilience in our provincial communities. More than a 100 people turned out to fight those fires and provide backup support, and the bulk of them were volunteers. Fire brigades, rural fire forces and emergency response teams attended from Dargaville, Te Kopuru, Ruawai, Whangarei, Kamo, Paparoa, Maungaturoto, Donnellys Crossing and Hikurangi. Some were on the scene all night. You know the same happens at all of our Northland communities, and across the country generally. Civil Defence, fire officers and St John volunteers turn out for their training; volunteers serve as caregivers, sports coaches, surf lifesavers, in schools and churches and at every level of our community. They remain largely unsung – the heroes and heroines of our community and, it is fair to say, its backbone. Volunteers are all ages, and volunteering offers the chance for older people to get the training to apply their skills, expertise and experience as they approach the end of their working lives and afterwards. People involved with volunteering finds it's a great way to meet others, it helps build mental and emotional fitness, it opens up new horizons and gives the volunteer a great sense of wellbeing. If that sounds like a call to make yourself available as a volunteer, then it is exactly that. But I want to come back to the theme of this column – resilience. The economic tough times are with us again. We have elected a government that focuses on the basics of governance and that people will have confidence in to lead the way through the next few years of recovery. Caution is required. Co-operation is essential. Community spirit is vital and underpinning all of these is the inherent resilience of our communities. This resilience starts with each one of us. There will be political differences, a variety of views and opinions on everything that people can find to disagree about, but there will also be a common sense of shared direction and shared community. People will look to their families. They will look to their neighbours, and they will look to their communities to see how they can lift their own game and help the next person out. We have had several years where one of the buzz-words was 'sustainability'. If this concept is given tight and practical parameters it provides valuable insight to forward planning, but the previous administration tied bureaucrats up with the concept, threw a lot of time and money at it with little really done beyond some posing on a global stage. There's a new buzz word, and it is clearly understood. It is underlined by the economic times we are now in and by the need for communities at all levels to work together. We are now looking for measures that tell us about the resilience of our communities, of our core governance systems and networks, and our economy. Rather than fomenting ideology for communities, resilience requires planning with communities. Resilience is a fundamental benchmark that underpins who we are and what we do when the heat goes on. With the older population predicted to double by the year 2028 and to be a quarter of our total population in 2051, we have a critical window of opportunity to address many of the issues facing older New Zealanders. New Zealand needs to carefully consider polices and services that ensure older people can live where they want and participate in their communities as long as they are able. The Office for Senior Citizens briefing I received in taking up office points to some of the challenges New Zealand will need to address. These include meeting older peoples' growing expectations on healthcare and ensuring older people know where to go for help and are encouraged to do so. We have the opportunity to improve needs assessments for older people so their health needs are better met, to work with local government on ways to make communities friendlier, safer places; and to support older New Zealanders to continue working for as long as they are able. I'm heartened that we are making good progress. Older people have a great deal to offer. Feedback from organisations working for older people reaffirms my commitment to ensuring that the valuable contribution all older New Zealanders have to make to this country is realised. There can be a tendency for older people to be isolated in their communities, to some extent, and also to find their contribution to the community around them marginalised. There is a need for all the agencies working with and for older people to interconnect as far as possible, and also to go beyond the rules to get results that mean something. Problems may sometimes be too complex for a single agency. The 'normal way' of doing it may not work, and new ways of working have to be created between agencies and providers to get the result. Older people themselves need to participate as far as possible – it is their experience that guides the process, and the result will be measured by the enhancement of their place in our communities. If you do what you have always done, you'll get what you have always got. Sometimes that's not enough. We all need to aim for more. We need to enjoy the satisfaction of working together for solutions, and these solutions need to result in enhanced lifestyles for older citizens, and also in enhancing their ability to continue to contribute to and enjoy the community around them. Older people are a valuable repository of knowledge. They often bring a tolerance of others not always enjoyed by younger people, and they are often more than willing to learn new perspectives, to listen to the views of others, and to join in a process of knowledge exchange. Contrary to popular opinion, older people are often far more open to change and challenge than other age groups who are more tied to the daily expectations of their lives. Many participate in non-governmental organisations and community groups involved with their sector, and this greatly enhances the delivery of services by the relevant government agencies. It helps create an inter-connected environment and knowledge base for citizen-centred services. The Ministry for Senior Citizens is an exciting portfolio and I look forward to working with all of you in continuing to lay a useful foundation for older people of today, and tomorrow. NCEA results have hit letterboxes and parents will be sharing in their children's success and getting ready for the new school year. The new Government is committed to ensuring that every child receives a quality education and that schools have the right tools to help their pupils succeed. Before the election, we promised to set National Standards in literacy and numeracy for all students in years 1-8 and prior to Christmas we passed legislation which enables the Minister of Education to do this. This legislation included tougher penalties for parents whose children are not attending school. Setting national standards in reading, writing, and maths will give parents a clear picture of how well their child is doing. Every student will be regularly assessed against these standards and reports on their progress will be sent home to parents in plain English. The Ministry of Education and the Minister will be talking with the sector, parents, and communities in the next six months about what these standards should look like and how they will implemented. We want parents to have real input in the education of their children. Poor attendance at school is a big problem across the country. The new Government has made penalties for truancy tougher to send the message to parents that a child skipping school is a serious issue. Prior to the law change, fines for truancy were less than fines for not registering a dog. Parents who don't enrol their kids at school now face a fine of up to $3000. The maximum fine for a first truancy offence has risen to $300, and to $3000 for a second or subsequent offence. These measures are designed to target parents that are wilfully letting their child skip school. The new Government is also focused on boosting trades training. The economic downturn has highlighted New Zealand's need for more trades people, and at present, there aren't enough trainees to replace trades people who are retiring. We will make sure that the curriculum at all schools includes the need for students to make and do things, and we will work with schools, tertiary organisations, businesses, and Industry Training Organisations to give schools more flexibility to run trades training outside the school gates. Before the election we announced plans to fund and open five specialist Trades Academies across the country in the next three years. These academies will give students who are great at practical work the option to become apprentices and take up a trade. We have already decided that one of these Trades Academies will be in South Auckland. National is delivering on our election promises. We believe in giving our children every opportunity to learn and achieve and we will work closely with parents and the community to make this happen. Maintaining strong international links is an essential priority for civil defence emergency management in New Zealand. The December issue of the Ministry of Civil Defence & Emergency Management's quarterly magazine, Impact, highlights some of our international links at central and local government levels. The Ministry's Director, John Hamilton, said that few, if any, countries in the world can respond on their own to a national disaster. increase our own ability to respond in New Zealand by learning from international experience and exercises. the Auckland Regional Civil Defence Emergency Management Group observing an earthquake drill involving 5.5 million people in California. Golden Bay "Even paradise needs a plan"
services available to the sector from the Ministry's CDEM Specialist Services unit. Around New Zealand the global economic crisis is beginning to bite. Household finances are coming under strain as unemployment grows, house prices falter, and share markets stumble. Many families felt added financial pressure at Christmas time – and will continue to struggle throughout 2009. The new Government recognises the economic challenges we face, and is focussed on finding solutions. As careful economic managers, we have put together a strong economic management plan which aims to provide fiscal stimulus that will lift us out of recession, and boost economic growth over the longer term. As part of our 100-days action plan, we have acted swiftly and decisively to provide temporary relief to those who are made redundant through our ReStart Assistance Package. We have passed legislation to reduce taxes which will put more money in New Zealanders' pockets from 1 April. And we have introduced a voluntary 90-day trial period for new employees to make it easier for small businesses to hire new staff. We are working on bringing forward infrastructure spending to promote economic growth, reforming the Resource Management Act, and getting better value out of government spending. We are also developing a number of new initiatives to steer New Zealand through the worst of the recession. In early February, the Prime Minister will announce measures to provide relief to small and medium businesses. Later that month, the Government will host a summit on employment which will bring together leaders from business, unions, and the community to focus on preserving and creating jobs. These are just the first steps we will take. Over coming months, you can expect to see a 'rolling maul' of economic initiatives that are pragmatic and affordable, and will help to build a higher growth economy over the medium to long term. The new Government knows that Kiwis are beginning to feel the sharp end of the global economic crisis. We are working hard to put our economic plan in place. And we will keep up the momentum to ensure that New Zealand families can combat the recession and look forward to the brighter future that they deserve.